China and Venezuela on Sunday stressed on carrying the legacy of former President Hugo Chavez forward by boosting ties between the two nations. Chinese President Xi Jinping and Venezuelan President Nicolas Maduro held talks at the Great Hall of the People in Beijing. Beijing has traditionally had strong ties with Caracas, which was reflected by the multibillion dollar oil and agricultural deals signed by the two sides following the meet. “China appreciates Maduro and the new Venezuelan government for continuing Chavez’s friendly policy with China and giving priority to developing bilateral relations”, President Xi said. Xi gave a red-carpet welcome ceremony to the Venezuelan leader who is currently on his first state visit to the Asian nation. “President Maduro, you are China’s good friend. 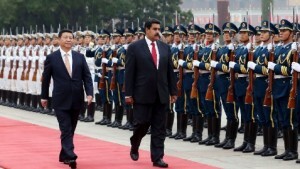 This visit to China will certainly further promote China-Venezuela relations to new heights,” said Xi. Venezuelan oil giant Petroleo de Venezuela SA signed a $1.4 billion deal with China Petrochemical Corp to develop Venezuela’s Junin 1 heavy oil bloc, which will produce 200,000 barrels a day. Venezuela is the world’s largest holder of oil reserves. China Development Bank also announced a $5 billion loan for Venezuela’s social development. “We reached an agreement (with the state-owned China Development Bank) on a $5 billion line of credit for development,” Maduro tweeted. The Export-Import Bank of China will also lend Venezuela’s state petrochemicals company Pequiven $390 million for the construction of a port. Venezuela has also secured funding from Chinese banks for a mining survey around the country and has agreed with China’s CITIC Group to move forward with gold mining projects in Venezuela’s Las Cristinas deposits. The Venezuelan president was involved in a diplomatic row with the US when Maduro said his jet was banned from flying over Puerto Rico on his way to China. “No one can deny airspace to a plane carrying a president on an international state visit. There is no valid argument to refuse airspace,” said Venezuela’s Foreign Minister Elias Jaua. In response to Maduro’s flight incident, Bolivia’s President Evo Morales suggested on Thursday the leaders of the leftist Latin America and Caribbean bloc ALBA should boycott the UN General Assembly meetings. Meanwhile, in Beijing, Maduro encouraged Chinese businesses to play a role in Venezuelan special economic zones. China and Venezuela will mark the 40th anniversary of their diplomatic relations in 2014. After the talks, Xi and Maduro witnessed the signing of 12 cooperation agreements on energy, education, agriculture and construction.